How is it that, despite of the enormous resources expended on the criminal justice system in South Africa, violence is increasing? The answer is that while a strong criminal justice system is essential, it can do little to prevent violence in the first place. To do that we must, among other things, support parents and children. This seminar focused on the importance of parenting for the prevention of violence and showcased two interventions that have been effective in addressing early risk factors for violence in adolescence and adulthood. Supporting parents is a key element in preventing child abuse and neglect. This is important because children who have been abused are at risk of becoming violent adolescents and adults, or being re-victimised. Rachel Jewkes, Director, Gender and Health Research Unit, Medical Research Council and Chandre Gould, ISS: What works to prevent violence? In short, our earliest life experiences have a profound impact on who we are and how we behave as adults. This means programmes are needed that target the three early predictors of violence – infant attachment, cognitive development and persistent aggression. Cooper shared research evaluation findings for two interventions developed and tested in Khayelitsha, South Africa:the Thula Sana programme that fosters healthy bonding between mothers and infants; and a programme that teaches mothers to share a book with their infant to stimulate cognitive development. 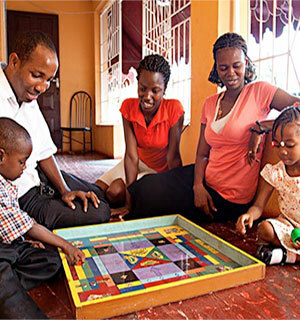 Thula Sana is a home-visiting programme. Community workers visit women from late pregnancy and for six months after delivery to provide parenting support and guidance. The aim is to promote sensitive and responsive parenting and secure infant attachment. An evaluation showed that mothers who benefitted from the programme were significantly more sensitive in their interactions with their infants. There was also a higher rate of secure infant attachments at 18 months. Book-sharing greatly benefits child intellectual development. Cooper, Murray and colleagues recently evaluated a book-sharing programme and found significant increases in the number of words understood by the infants, the number of words that infants could vocalise, and substantial gains on a measure of sustained attention. This programme is simple and inexpensive, and can enhance child cognitive development. These studies provide sound evidence for addressing two of the early predictors of violence in South Africa. More needs to be done to develop composite interventions that target all early risk factors. Effective interventions must be costed, and sustainable ways for taking them to scale developed.